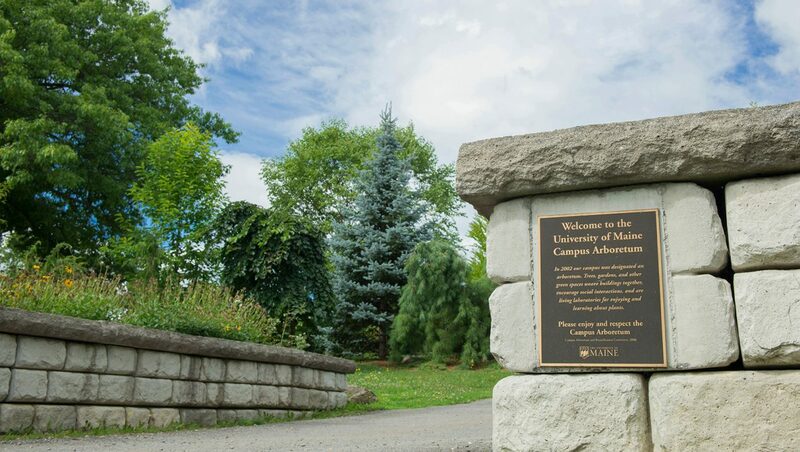 The official campus arboretum welcome is here. The arboretum plaque is located on the right side of the stone wall near a walkway that takes you through a semi-enclosed, upward sloping garden containing a number of unusual ornamental trees. The garden, created as part of a major campus beautification project in the early 2000s, is adjacent to the Maine Bound Adventure Center. The facility, constructed in 1931 for horses, features a design known as the Louden Barn or the Iowa Barn. The west side of the building, facing a visitor parking area, contains Palladian windows. In 2002, the barn was reconfigured as a recreational facility, complete with an indoor climbing wall.